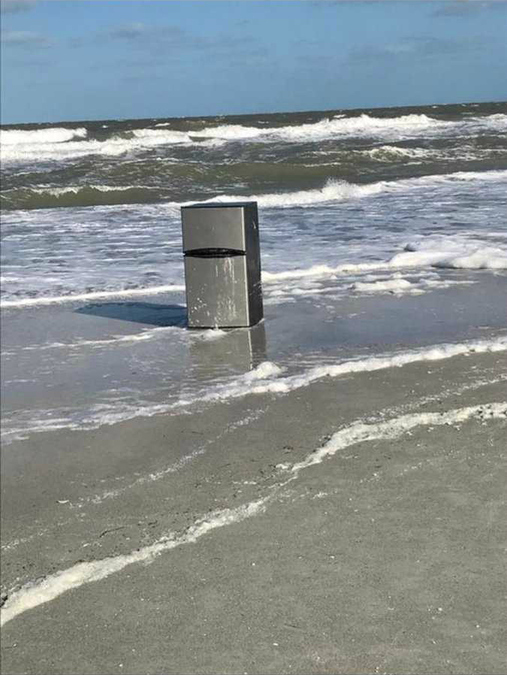 INDIAN ROCKS BEACH, Fla. — A group of Good Samaritans removed a refrigerator that was found near the water along Indian Rocks Beach on Thursday evening. A picture shows the fridge sitting in sand and water in between 7th and 8th Avenues. The man who took the picture is a retired boat captain and said the waves were big in the Gulf on Thursday as it was windy for part of the evening. He tells us instead of leaving it in the water, he and his buddies took it up the beach and left it on the curb for scrappers. Calvin Warren with Indian Rocks Beach sanitation department tells ABC Action News they would have removed the refrigerator if they knew it was out there. Warren said all things wash up along the beach, but their sanitation city crew is usually out there first thing in the morning dumping the trash cans, and cleaning up any debris before beachgoers arrive. Ronald Cote, who is in town for two weeks, tells us Indian Rocks Beach is one of the cleanest beaches he's seen, "I can't imagine anybody dragging one (fridge) down here to throw it away, so it probably fell off." Warren said although the city didn't see the fridge, it very well could have washed up, or someone could have thrown it off a boat in the Gulf of Mexico. Keep Pinellas Beautiful tells us they cleaned up 180 pounds of trash from the Indian Rocks beach during their the Great American Cleanup project last month. Patricia DePlasco, Executive Director of Keep Pinellas Beautiful, said they are in the middle of the countywide Great American Cleanup and in all they have removed almost 200,000 lbs. of litter and debris from public areas in the county. If you observe illegal dumping you can call 727-210-4663. They will ask you to identify the type of litter on public land, the location with a street address and cross street and a name and phone number for follow up information.